I’ m planning on introducing you to the staff at Argent over the next few months so I thought I should start with a little bit about myself. I studied at……. Birmingham School of Jewellery for a BA Hons in Jewellery and Silversmithing. When I was growing up I wanted to be…….. an Air Hostess, it seemed like such a glamorous job but now it wouldn’t appeal to me at all. I think I could have enjoyed being an Interior Designer and nearly chose that course over Jewellery but I think Jewellery has served me well. Favourite piece of jewellery that I own…….. Shaun Leane signature long tusk earrings. Piece of jewellery that I aspire to have…….. the 18ct white gold and diamond set version of the Shaun Leane long tusk earrings. I can’t live without…….. my boys (my husband, two gorgeous sons and labradoodle dog). Favourite pastime…….. walking my dog Billy or sharing coffee and cake with close friends. Favourite restaurant in Leeds…….. Shear’s Yard, not only is the food excellent and beautifully presented but the restaurant has happy memories for me as we used to go each year for the Argent Christmas party. Best holiday ever…….. two weeks spent travelling around Tuscany and Umbria, beautiful. Next year it’s my 50th birthday and I would love to go to Bali, the very first range of jewellery I bought was Balinese and now Chlobo is one of my favourites, I think it would be an inspirational trip! Highlight of my job…….. feeling like I’ve really connected with customers, many have become my friends. One thing I’m most excited about at the moment…….. our 25th Anniversary event in the shop on 11th October! I’m really looking forward to celebrating with our customers so many of whom have become good friends over the years. Favourite film…….. Barbarella, Edward Scissorhands, Moulin Rouge. Book….. anything by Penny Vincenzi – pure escapism. Favourite jewellery designer…….. A difficult one, I have many…… Shaun Leane (of course), Alex Monroe and Chlobo. I’m thrilled to be getting a Chlobo cabinet installed in the shop, the range is so wearable, it’s described as ‘boho chic’. I love the story behind the range and I’m always excited to see the new collections which are inspired fashion and current trends. With August 1st being Yorkshire Day I thought it would be appropriate to choose one of our Yorkshire based jewellers as ‘Designer of the Month’. Amanda Cox is based in Hebden Bridge, we have stocked her work in Argent for over six years and it is always very popular with our customers. Her timeless ‘Lily Collection’ is a favourite, featuring delicately beautiful flower shapes and fresh water pearls, drawing inspiration from nature, the designs are modern yet classical with a hint of vintage style that reflects current trends. Having previously lectured in Jewellery and Metalwork at Plymouth College of Art and Design, Amanda has returned to her original passion – designing and creating contemporary jewellery at her studio in Yorkshire. Amanda’s work has developed from and been inspired by a combination of the exploration of metal’s tactile properties and the visual qualities of simple organic forms. The birthstone for July is ruby, one of the first bespoke commissions we did was this beautiful ring set with two marquise cut rubies and diamonds. We work with a highly respected local artisan jeweller who has over twenty years experience designing and creating extraordinary jewellery. He was one of the first jewellers in the UK to embrace computer aided design which allows you to see your design in it’s true form before the piece is manufactured and can show a range of ideas which can be manipulated to your requirements. It’s lovely to be able to help design a unique piece for a customer which is individual to them. Each piece is created by hand in his workshop without mass produced designs or parts. Find out more about Argent’s Bespoke Service on the Bespoke page of the website. The month of July sees the start of Argent’s 25th Anniversary celebrations. To mark this occasion we will be showcasing a different designer each month for the duration of the celebratory year. Alex Monroe will be our ‘Designer of the Month’ for July, his work will be displayed centre stage in the shop window throughout the month and every customer spending £50 or more on jewellery from the ‘Designer of the Month’ will receive an Argent gift voucher. It wasn’t all that long ago that Alex Monroe was celebrating his own 25th Anniversary, he designed the beautiful ‘Hooray’ necklace to commemorate this achievement. Fans of Alex’s work may also be interested to know of his recently published book ‘Two Turtle Doves – A Memoir of Making Things’ which is available to buy in store (one signed copy left!). Having trained at the Sir John Cass School of Art in London, Alex started making his own jewellery in 1986, out of a small workshop in South London. To this day all of his jewellery is still hand made by a team of highly skilled jewellers in that same picturesque studio. 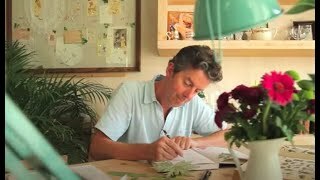 Growing up in the Suffolk countryside surrounded by plants and animals, Alex has a great love for nature and it has become a strong theme throughout his work. He has the wonderful ability to translate the attributes of delicate natural objects into precious me tals. Alex makes all of his original designs by hand, using traditional jewellery making techniques he works directly into silver as opposed to wax, a method which allows him to achieve the high levels of detail and texture that are such a feature of his jewellery. The intricate detail in the ‘Bumblebee Necklace’, one of his most popular pieces, is amazing and having coveted the ‘Baby Bee’ necklace I finally gave in and am now sporting the gold vermeil version. I wear it daily and it is constantly admired. I am looking forward to the launch of Alex’s new Autumn/Winter collection, with everyone returning to the ‘make do and mend’ mentality and the success of the recent TV programme ‘The Sewing Bee’ it seems appropriate that it should be called ‘The Haberdashery’. The collection consists of charming representations of key sewing box accessories that only Alex could interpret in such meticulous detail. I returned from my recent holiday in a positive frame of mind. The light evenings have encouraged me to start eating a healthier diet and to get more active with the kids, what better way to see our beautiful countryside than to get out on our bikes! Of course cycling is particularly topical this year with the forthcoming Tour de France passing through our neck of the woods at the beginning of July, The Grand Depart takes place just down the road from Argent in Leeds. I can’t believe it was a year ago that our youngest son congregated outside Leeds Town Hall with his school friends, sporting his yellow T-shirt to promote The Worlds Greatest Cycle Race. It came as no surprise therefore when it was announced the theme of the schools summer ball this year would be the Tour de France. It couldn’t have worked out better for me as I already had a new bright yellow floor length dress that I have decided to accessorise with Alex Monroe’s gold vermeil bicycle pendant…… would you believe that not only do the tiny wheels turn around but the headlight is set with a diamond and the rear with a ruby! What else would you expect from Alex Monroe? His attention to detail is second to none. Inspired by the actual bike Alex uses to cycle to work, the necklace enables you to get that cycling chic look without all the hard work! Having just returned from a lovely break in Tenerife I’m definitely feeling the chilled out holiday vibe. I was thrilled that the new ‘Let’s Dance’ Chlobo collection arrived at the shop just in time to help me put together my beach look. I loved adding a pop of colour to my gold Chlobo stacking bracelets. I love the way Chloe has introduced the neon look with tassels in coloured thread. In the core collection the silver tassel is used as a symbol of protection, translated into neon colours it gives this new collection a more casual and funky feel and the vibrant colours bring a fun, fashion element to the summer collection, reflecting this seasons trends. Another favourite for summer holidays is the Lucky Eyes collection, their ‘Monaco’ friendship bracelets come in a variety of semi-precious stones with contrasting silk cords, representing on trend summer colours. The diamanté set rose gold vermeil adds a sparkle which allows you to take the look through to the evening. It was great to come back to sunshine, and with a bit of a tan! I can finally ditch the black boots and winter woolies and feel at one with my new collection of Chlobo neon brights. I can’t believe it’s Easter already, a great excuse for me to go shopping for Easter eggs in the gorgeous chocolate shop across from us in Thorntons Arcade though. I always notice their fabulous window displays and could easily be tempted to buy their chocolate treats all year round……. however if you’re looking for an alternative to chocolate, Alex Monroe’s ‘Fat Hen’ necklace in rose vermeil is one of my favorites and this year’s Easter collection from Trollbeads is a winner! The Bunny is already a firm favourite with us all here at Argent. The Precious Easter Eggs are available in three stunning colours, they are beautiful and a little bit more affordable than the famous precious eggs designed by Carl Fabergé! I read an article recently about an intricate golden egg, encrusted with diamonds and sapphires, which was bought for £8000 from a bric-a-brac stall in the US. The buyer had intended to melt it down for scrap until he discovered what he actually had was a long lost Fabergé egg worth £20 million! Carl Fabergé designed a total of 50 precious eggs, the first one was produced for Tsar Alexander III in 1885, the Tsar gave his wife an egg every year during the Russian Orthodox Easter festival. The tradition of giving eggs has been associated with Easter for centuries, representing new life and fertility they were originally linked to Pagan spring festivals and later adopted by Christians to symbolise the resurrection. Happy Easter! I hope you enjoy your Easter gifts whether they’re precious or made of chocolate! With Mother’s Day around the corner I’m reminded of all our floral inspired jewellery. Lilies are one of my favourite flowers, their simple forms are brilliantly represented in Yorkshire designer Amanda Cox’s ‘Lily Collection’. The classic combination of silver and freshwater pearls appeals to all ages and is perfect for all sorts of occasions from weddings to special birthdays, a piece from this collection would make a great Mother’s Day present. Alex Monroe and Amanda Coleman also feature flowers in their designs. Amanda Coleman creates delicate, romantic pieces inspired by orchids, fuscia, roses and other flora and fauna, (the owl pendant below is a particular favourite), reflecting her love of nature and passion for tiny things. Alex Monroe is also influenced by nature, the rose; daisy and chrysanthemum are all included in his collection along with his ever popular bumble bee. The appeal of both these ranges is the intricacy in which nature is depicted in miniature. We all enjoy a walk in the country on a lovely spring day, we seem to spend so much time in front of a screen or on our gadgets these days, it’s good to escape the day to day stresses and get back to nature. Although, with our increasingly busy lives, it’s not always possible to do that so why not bring a bit of nature into your everyday life by wearing it! Alex Monroe fans might be interested to know that he has recently published a book. ‘Two Turtle Doves A Memoir of Making Things’, tells the story of the internationally famous jewellery designer and gives an insight into how he has combined creativity and success. I can’t wait to read my copy! It is available to buy from us in store and would make a lovely present. We have a limited number of signed copies too! Spring is definitely in the air! Like me, you may be thinking about putting together a fresh new look for this season. One of my favourite spring collections is ‘Cherry Blossom’ by award winning British designer Shaun Leane, it features intricate soft pink, lilac and cream enamelled flowers scattered along entwined branches of silver and gold vermeil and complimented by semi-precious stones, diamonds and pearls. The collection is inspired by a Japanese fable in which a beautiful Goddess named ‘Princess Konohara-Sakuya’ sprinkles seeds from the clouds of Fuji Mountain which then flourish into white and crimson flowers. This magical bud is named after the goddess Sakuya, now recognised as Sakura, or in translation, cherry blossom. To this day in Japan, the beauty of cherry blossom is celebrated in the traditional festival of Hanimi. The date of the celebrations varies from year to year and is predicted by the Weather Bureau in their blossom forecast. This year, a little bit earlier than usual, from the 13th March onwards parties will be held wherever cherry blossom can be found. It is said that ‘a cherry tree blooms at the time of good news’. To celebrate this Trollbeads selected the Sakura design as one of their recent ‘People’s Beads’ (designed by Trollbeads fans from around the world). A beautiful silver Cherry Blossom bead is also featured in the main Trollbeads collection and I’m looking forward to receiving the new Cherry Blossom fantasy gift set, to be launched on April 11th 2014 – I’ve seen pictures and it looks amazing! Until then why not add some colour to your Trollbeads bracelet, take a look at the Spring 2014 collection, inspired by the Hanging Gardens, gold shimmers through the colour in this gorgeous glass Sparkle Kit. I’m excited about selecting my new Trollbead bracelet combination and coordinating my new spring colours. The light mornings have definitely inspired me to put away those winter woollies, sort through my wardrobe and make the change from winter to spring. Well, here we are… the beginning of our ARGENT 25th Anniversary Year! Here in the shop we are gearing up for Valentine’s Day, I love this time of year! It’s nice to have something to look forward to following the lull after the Christmas Festivities. It is a perfect time to be thinking of that special someone. Any day soon we are expecting the Valentines Collection from our best selling range Nomination. With a starting price of £18 per charm, this is the perfect alternative to chocolates! If collectables is your thing, then don’t miss out on the Valentines Collection from Trollbeads. In the CholBo range there’s plenty of love related stacking bracelets to choose from, popular with many of our regulars and celebrities alike, I too adore my stacking bracelets and take great pleasure in choosing my look for the day. Another range on a romantic theme is Oak, a particular favourite of mine is the spinning heart necklace, now also available in rose gold vermeil. For that extra special present or for those of you thinking about proposing at this romantic time of year, don’t forget we also have diamond jewellery in classic styles as well as quirky designer pieces. We are always here to help you, if you can’t see what you want online, do give us a call or pop into the store where we can help with any special requirements. Finally, whatever you decide to do – have fun this Valentine’s Day!